Infiniti isn’t due to fully reveal its new Q Inspiration Concept car until the Detroit auto show later this month, but it can’t resist teasing more details about the curvaceous concept. Promising what Infiniti claims will be “the next step” in the automaker’s design language, it’s another step in the sedan’s blurring from the traditional three-box four-door, to something a lot more interesting – and, Infiniti hopes, appealing to consumers. 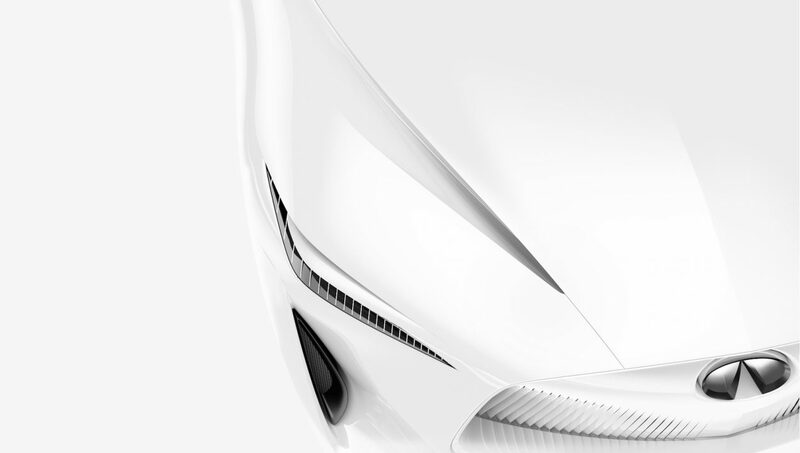 We saw the first hints of it in mid-December, when Infiniti first announced the concept’s existence. Back then, all we saw was a chunk of hood and grille, though even that small portion was enough to highlight a very different aesthetic to Infiniti’s current cars. More angular lamps, a bolder and sharper grille with less of Infiniti’s usual curving, and some very deep crease and cut lines. 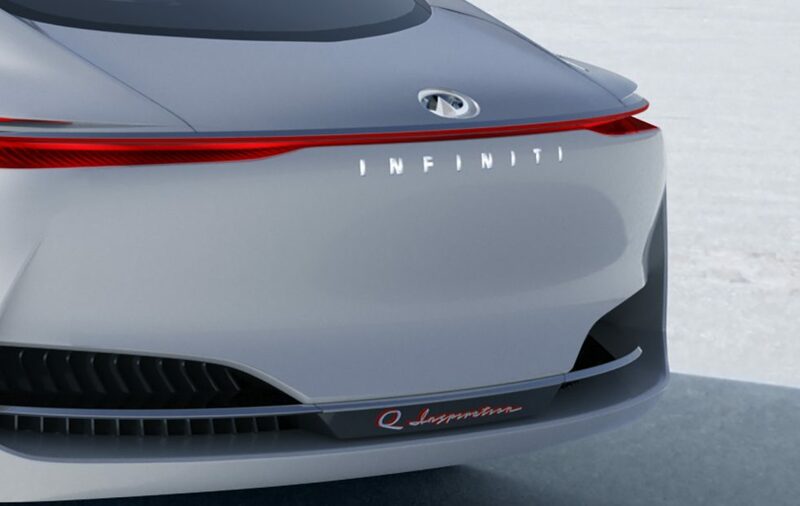 Now, we get to see the Infiniti Q Inspiration Concept from the rear. Again, it’s a very different look from what we know of Infiniti’s current sedans, with a sweeping roofline and the omission of the scalloped rear pillar that has made the automaker’s cars so distinctive from the side. A full panoramic glass roof curves from the windshield and all the way over the top of the car, seamlessly blending into the rear glass. Meanwhile the rear lights have been condensed into a single, narrow bar, that cuts through the bodywork. There’s a little Porsche Panamera up around the front wheel arches and the sculpts to the doors, and perhaps a little Tesla Model S to the rear haunches. Maximizing cabin room while minimizing exterior dimensions has been something many automakers have been reaching for, particularly with the arrival of electrified powertrains that allow motors to be pushed out to the wheels, and batteries slung low under the floorpan. Infiniti isn’t saying exactly what might be driving the Q Inspiration Concept, but does promise that it’s the automaker’s next generation of propulsion. That means autonomous technologies too, along with “breakthrough drivetrains” the company’s team said last month. Could this be Infiniti’s take on the Model S? That’s no small challenge, though Nissan’s best-selling Leaf would give the Infiniti engineers some good insights into what an all-electric car should deliver. We’ve already seen what that can lead to in the shape of the Infiniti Prototype 9 retro racer; perhaps it’s now time for it to make it one step closer to the showroom. This car is actually very beautiful.